Eric Couper presents at Columbia University. Last week, Eric Couper, AfSIS’ ICT and Agriculture Coordinator, had the opportunity to discuss AfSIS’ mobile data collection work with colleagues and students affiliated with Columbia University’s Earth Institute. 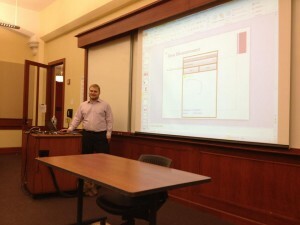 Chris Planicka wrote about the presentation for the New Media Task Force (NMTF) blog. He summarizes the talk and encourages members of NMTF to consider the role Open Data Kit could play in their work. The results he shared at the colloquium highlight the possibilities, as well as the continuing challenges, of using mobile technology for data collection. We felt New Media Task Force members will find these results, and the hardware and software utilized by the team, interesting and useful! The ppt from the presentation is available here.